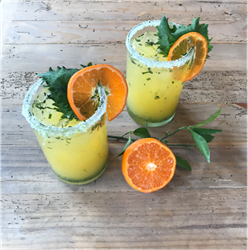 Ojo Caliente Mineral Springs Resort & Spa and its sister property, Sunrise Springs Spa Resort, announce two new unusual margaritas made especially for National Margarita Day, which takes place annually on February 22. Ojo is featuring its Agave Wine Margarita plus new infusions of prickly pear, jalapeno, strawberry, mango and spicy ginger. Sunrise Springs Spa Resort’s Executive Chef, Rocky Durham has created an edible cocktail especially for this event: The Sunrise Springs Shiso Yuzu Margarita. Like tequila, agave wine comes from the Webber blue agave plant, which takes up to ten years to mature before they’re harvested. The process of making agave wine starts the same way as tequila—the mature agave plants are cooked to release sugars and the aguimel is then extracted using molinas, or, crushers. The aguimel is fermented, and instead of distilling to make tequila, the aguimel is filtered and mixed with 100% de agave blanco tequila to fortify the wine to 24% ABV. Sunrise Springs Spa Resort’s Shisho Yuzu Margarita is filled with bright citrus and incorporates an Asian fruit growing in popularity in North America called Yuzu. Mainly cultivated in Japan, China and Korea (where it’s often combined with sugar and honey to make a marmalade-like syrup used in yujacha tea), Yuzu has a fragrant aroma and refreshing flavor that’s less tart than its citrus counterparts. The spiky, dark Shisho leaves, another Asian inspired component, offers up an almost minty counterpoint to the citrus elements. Some might say Shisho is like basil or even cilantro. The result is supremely refreshing. 1. Zest Yuzus, mix with kosher salt and place on a small plate or saucer. 2. Thoroughly muddle sugar and shisho together until a green paste is achieved. 3. Combine with remaining ingredients, 1 cup of ice and shake very well. 4. Rub rim of glasses with Yuzu to moisten and place rim into yuzu-salt mixture. 5. Fill glasses with Ice and pour in margarita. We’d like to add that at home, Chef suggests using Premium Silver Tequila for the Agave Wine and Cointreau for the Agavero.